I have a terrific treat for you! Calie from Broccoli Cupcake is here with a guest post perfect for the start of summer. She blogs about healthy family and women's lifestyle choices, and if you check out her adorably named blog, I bet you'll learn something new and get a lot of inspiration. In honor of the upcoming pool openings and the gorgeous weather I decided to take some time to give our pool bag a makeover. As I work to make healthier choices for my family and the earth here are five changes I made to last year’s pool bag. 1. Replaced plastic sandwich bags with reusable bags from Snack Taxi. 2. Replaced juice boxes and Capri-Suns with Sigg reusable water bottles – durable, good for the planet and come in tons of designs to suit every personality, plus my kids think they’re cool b/c they have sport tops. 4. Replaced Neosporin with Silver Shield to disinfect cuts and scrapes. Sun hats, Rash guard shirts and sun-protective terry cloth cover-ups. We cover up during rest periods and snack breaks so we can enjoy more time in the water without worrying about sunburn. So that’s my pool bag makeover. I’m still looking for a few eco-friendly pool toys, but they are hard to find. I ’d love to hear what’s in your pool bag this year? Please share your tips at Broccoli Cupcake. Please leave lots of comment love!! Check out Broccoli Cupcake (it's good for you!) and follow her on Twitter @Calie20. I love Kiss My Face products! Particularly the shampoo! Guess I'll have to test out a few more items. Any suggestions? And I love the beach tote makeover. For those who want to make their own reusable sandwich bags, CluckandTweet.com have super easy instructions. Cheap, too! Hi Calie! Great ideas. I had never seen the Snack Taxi bags. Those are awesome. My girls LOVE Capri Suns and I stock up on them when on sale but for soccer practice I've been filling a water bottle. Still I realize I have a LONG way to go to make our family pool bag more earth friendly. p.s. my youngest is out of swim diapers but I bought hers several years ago at Target...go Tarjay! That's a great make-over! I need to check out those sunscreens. And I've been eying some Sigg-type reusable water bottles, too. I replaced plastic sandwich bags with these (http://www.nubiusorganics.com/Wrap-N-Mat-Reusable-Sandwich-Wrap-with-PEVA-Liner-P328.aspx) reusable sandwich wraps last summer. My mom made some more for me and I used them all school year in the kid's lunches. I'm going to try the snack taxi and get the kids some of those cute Siggs! 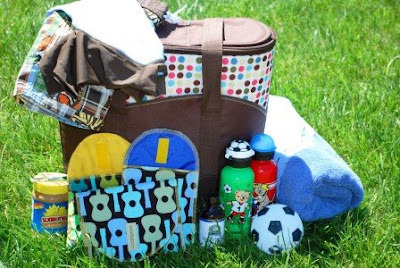 I'd never looked at the Sigg site before and had no idea what cute kid styles they have there. Thanks for the feedback ladies! Aren't the Siggs surprisingly adorable?!? I use a cheaper version from Target (love Tarjay Jamie!) for myself, but couldn't resist for the boys. Great post!! Thanks for helping Calie out, Amy!! Love the reusable swim diapers! But then again I love reusable cloth diapers anyway. Way to go! Jill - She's actually helping me! It was the perfect week for a guest poster and her site is terrific. So win-win! I plan on doing a cloth swim diaper this summer too. Thanks for the info on the sun screens (here and on your own website). I was using Aveeno too, and I plan to pull that out, and try to get another natural version and try some of your other tactics as well, like the terry cover-ups when not actually in the water. I've already got sigg bottles for me and my little guy. Calie just announced on her site a series called Make Up Bag Monday during the month of June. Sounds like something to check out! I've read so many thing about sunscreens in the past year that my head spins when I think about it. But it is time to replace last years stuff - thanks for the reminder! What is sunbutter? Combining two of my favorite things, sun & butter, must be delicious! Thanks for some great 'makeover' ideas. SunButter is basically peanut butter made from sunflower seeds. It tastes very similar, but has less sugar and is a little better for you. My kids love it and so do I. We put it in yogurt parfaits, dip our fruit in it and put it on crackers. Yum! I love my Sigg and will definitely be looking into the reusable snack bags. Thanks!! I must have gotten a bum batch because I bought all 3 kids Sigg bottles last summer and all 3 broke within a month. But on the bright side, all my kids are competent enough in the pool that this summer, my bag will have some junky paperbacks in it! I think we a sisters seperated at birth! I use cloth diapers all the time. I have the thermos Funtaniers for drinks. They are awesome and keep drinks cold for up to 12 hours! Reusable drink containers totally rock. The fabric I ordered to make my reusabale snack and sandwich bags it arriving tomorrow!!! I'm going to start making my own and try make a little cash by selling them. That bag just looks so exciting, makes me want to skip out of work and have a picnic! Wonderful ideas...now if I just had a stimulus check to cover the cost, we'd be in business! I love these creative, ingenious ideas! !